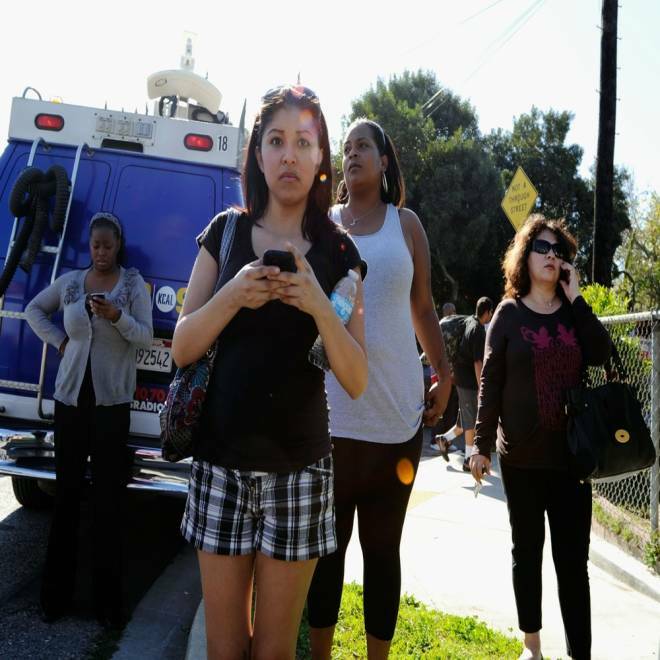 People wait to be reunited with loved ones after a school shooting at Gardena High School on January 18, 2011 in Gardena, Calif. According to reports, a student had brought a gun into school in a backpack and the weapon accidentally fired, injuring two students. As lawmakers at the state and federal level weigh various measures to stem gun violence, here are some facts and figures on guns and crime, compiled by the NBC News research department. Every year in the U.S., an average of more than 100,000 people are shot, according to The Brady Campaign To Prevent Gun Violence. Every day in the U.S., an average of 289 people are shot. Eighty-six of them die: 30 are murdered, 53 kill themselves, two die accidentally, and one is shot in a police intervention, the Brady Campaign reports. Handguns comprised 72.5 percent of the firearms used in murder and non-negligent manslaughter incidents in 2011; 4.1 percent were with shotguns; 3.8 percent were with rifles; 18.5 percent were with unspecified firearms. 13.3 percent of homicides were done with knives or other cutting instruments.